Automotive dealerships are highly effective at capturing consumer attention, although most of us can live without the stereotypical screaming salesman we’ve all seen on television. A similar argument can be made for inside the dealership. Well-intentioned managers and employees have long worked to inject excitement into the dealership, with varying degrees of success. Zamora certainly isn’t alone. Like most dealers in the country, he has experienced ups and downs with advertising, both inside and outside the dealership. Intuitively, he knows some of his efforts have worked, but he is uncertain of which ones. Honda of Superstition Springs planted the seed for its current in-house advertising solution in 2008, when the company launched programming from the Automotive Broadcasting Network, or ABN. Earlier that year, ABN launched its Dealer TV service to enhance the automotive retail experience for customers and better control sales environments. Much of the content was entertainment-based programming from CBS and other broadcast and cable networks, along with customized, dealership-specific advertising. In 2012, ABN transitioned from its broadcast satellite platform to an Internet-based architecture to execute a more dynamic content strategy. The company is using the InfoCaster suite from Harris Digital Out-Of-Home to create content, manage the network and play all the media. The InfoCaster platform gives ABN far more flexibility to communicate targeted messages not only to different dealerships, but to various departments at each network location. Honda of Superstition Springs is certainly one of those success stories. Zamora reports that there was an initial “wow factor” with the new digital signage-driven rollout, injecting new life into the 8-year-old dealership. Zamora has nearly 30 screens across the dealership now, including digital menu boards in the service drive. And the targeted content tailored to each department has noticeably translated into bigger sales. Daniels notes that the dealership’s specific business objectives are the first thing ABN discusses with new dealerships. These objectives can vary but typically focus on some combination of increasing sales, controlling environments and improving the customer’s experience at the point of sale. The advantage of the Harris Digital Out-Of-Home platform means that ABN can now do all three very effectively. Orndorff adds that ABN’s network look has improved since moving to InfoCaster, notably on the graphics side. He notes how InfoCaster allows his creative staff to include more animations in the screen designs, which he said makes the network more engaging for the retail consumer. This connects to the “wow factor” that Zamora describes when referencing the content on his screens, notably the large showroom videowall comprised of four 47-inch display screens. The content changes upon moving from the showroom to other departments. The showroom screens remain focused on the joy of buying a new car versus the drag of changing your oil. Still, Honda of Superstition Springs has been very effective at utilizing the targeted capabilities of InfoCaster for its parts and service departments. The dealership added digital menu boards in their service drive, where customers can clearly see available services, discounts and comparison prices. Screens hang underneath the canopy as customers drive their cars into the space. Customers can also see price lists on digital menu boards near the service advisor station and the parts boutique. Daniels notes that the setup at Honda of Superstition Springs has been very successful at driving the customers from the service waiting area into the showroom. This includes offering test drives and trade-in incentives through car appraisals. In the bigger picture, it represents the power of in-store advertising when properly executed. Zamora agrees, noting that the proof is in the numbers. The additional revenue generation is a clear and tangible benefit, but there are other benefits less obviously tied to the bottom line. This is especially noticeable on the social front. ABN is also leveraging social media integration with InfoCaster, incorporating Facebook and Twitter functionality in its latest software update. One new feature delivers tweets, posts and other social feeds across the bottom; the data sticks and rotates instead of a moving across the screen as a simple scroll. This is especially popular in service areas, where dealerships can easily communicate service messages to waiting customers. More interestingly, a new mobile app allows a salesperson to take a photograph of a customer with his new car, and quickly post a congratulations message to the dealership’s Facebook page. 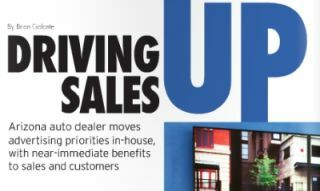 “We’re really trying to integrate these screens with business processes at the dealerships while truly leveraging social media at the same time,” Daniels said. This is a message that absolutely resonates with Zamora.